Northeast Frontier Railway celebrated the 70th Independence Day of our Nation in befitting manner. The central programme was held at the Maligaon Railway HQ complex, where Shri Chahatey Ram, General Manager of NF Railway unfurled the National Flag in presence of a huge gathering of railway officials and their family members. 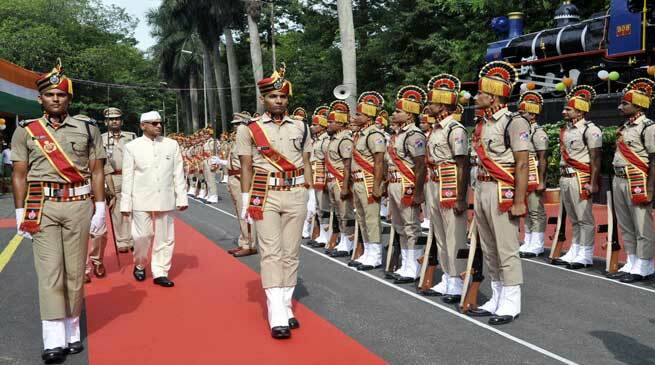 The General Manager also inspected an impressive Guard of Honour given to him by RPF contingents and Bharat Scouts & Guides. The Independence Day was also celebrated in all the five Divisions of N.F.Railway viz. Tinsukia, Lumding, Rangiya, Alipurduar and Katihar, where the Divisional Railway Manager unfurled the National Flag in presence of Divisional railway officials and their family members. In his speech General Manager highlighted the need for having Swachchta or cleanliness in railway stations and coaches for better passenger service. He mentioned about the initiatives taken in this regards like fixing of Bio-toilets, Clean My Coach app, On Board Housekeeping Service (OBHS) etc. to improve the overall perspective and protection of our environment. He also mentioned that 10 pairs of new trains have been introduced in current year, 22 trains have been augmented by adding additional coaches and run of 4 pairs of trains extended with provision of additional stoppages. Provision of free Wifi services and Reverse Osmosis based purified water at Guwahati station for better passenger amenities & use of apps like Twitter and Facebook to improve accessibility of customers also finds mention in the speech. The General Manager asked all employees and responsible members of the civil society to spare no effort for ensuring growth and well being of Indian Railways and the Nation at large. Later the General Manager alongwith members of N.F.Railway Womens Welfare Organization distributed fruits and other items of medical importance amongst the admitted patients of the N.F.Railway Central Hospital, Maligaon.